Also see our links page for the latest updates on available models and equipment. 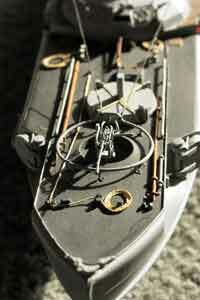 Here are a few of the models I have of various PT Boats and related military ships. PE 7205: PE Fret for details for the PT-109/PT-117 kits. 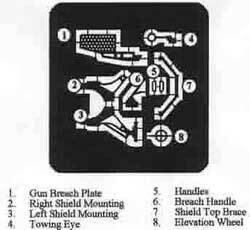 The parts are too numerous to list here. 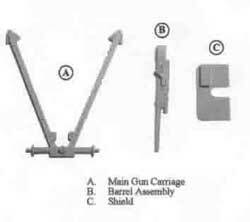 PE 7216: US Army 37mm anti-tank gun, without wheels, as fitted on PT-109 and other PTs. White metal and photo-etch. At the current exchange rate, this item is priced at .04. PE 7217: US Navy Mk.3 Single Bofors 40mm gun, as fitted to PTs from 1943 to 1945. White metal and photo-etch. At the current exchange rate, this item is priced at .29. M4 37mm Oldsmobile cannon with tripod pedestal. Mk. XIII torpedoes with roll-off racks. Depth Charges with roll-off racks. Single 20mm Oerlikon cannon with pedestal. Items PE 7216 and 7217 can be ordered from WEM's web site: www.whiteensignmodels.com. 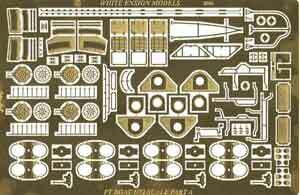 Here is a sampling of the aftermarket photo-etched sets for PT boats available from White Ensign Models.